The first part of 2015 has been a blast! I had an incredible time at the Calvert Trust centre next to Exmoor, assisting on creative music workshops for adults with a range of disabilities, coordinated by an amazing charity, Share Music Southwest. It’s hands down one of the best things I’ve ever been involved in. I’ve loved working with Merton children on creative responses to Stravinsky’s ‘The Soldier’s Tale’ – you can see some of that work here. It was a pleasure to work as a BeCreative Music workshop leader alongside Olivia Carruthers from the excellent Teach-It-Thru-Drama team – the childrens’ dramatic and musical ideas were quite something for minds so young! I was also really lucky to join the excellent Laura Jurd for two gigs as part of her Human Spirit tour, launching her second album of the same name. As always, she’s written some deeply soulful, passionate, lyrical, beautiful music. 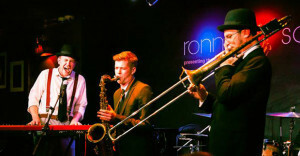 Check out this review from our gig in Brighton – I’m down as the usual (and brilliant) trombonist, Colm O’Hara, who I was depping for that night. And secondly, The Dissolute Society, a project that features my own words and music that reflect on my life experiences, including family, grief, friendship and hope. It’s a mixture of contemporary improv, jazz, contemporary classical, spoken word and groove, and I’m so glad to finally get it out there! I’ll be joined on this gig (contrary to the Vortex listing) by Fini Bearman on vocals, Laura Jurd on trumpet, Naomi Burrell on violin, Gustav Clarkson on viola, Francesca Ter-Berg on cello, Phil Merriman on keys, and Simon Roth on drums. You can discover more details and book tickets here. Pictures and music from that gig will follow – of course, would be wonderful to see you there! It’s here for me to share with you all the different sorts of things I do as a musician – have a look/listen around, and enjoy. 2014 was a great year for me which included joining ska/reggae act The Dualers, continuing to work with WorldService Project towards our third album, and putting in motion my own project The Dissolute Society which will be performing its debut gig in February 2015 at the Vortex Jazz Club. Workshop leading has been a real thrill too, with BeCreative Music going from strength to strength – we’ll soon be working with children to produce creative responses to Stravinsky’s Soldier’s Tale – and I have also really enjoyed my journey thus far as a Spitalfields Trainee Music Leader. High hopes for many exciting projects in 2015… watch this space!